As books are to Hannah, puzzles are to Margaret. It is expensive to keep her well stocked and I have taken to buying them at Goodwill. As well as costing a mere $1, they have the added benefit of coming with several pieces already missing. Pre-owned, pre-lost. 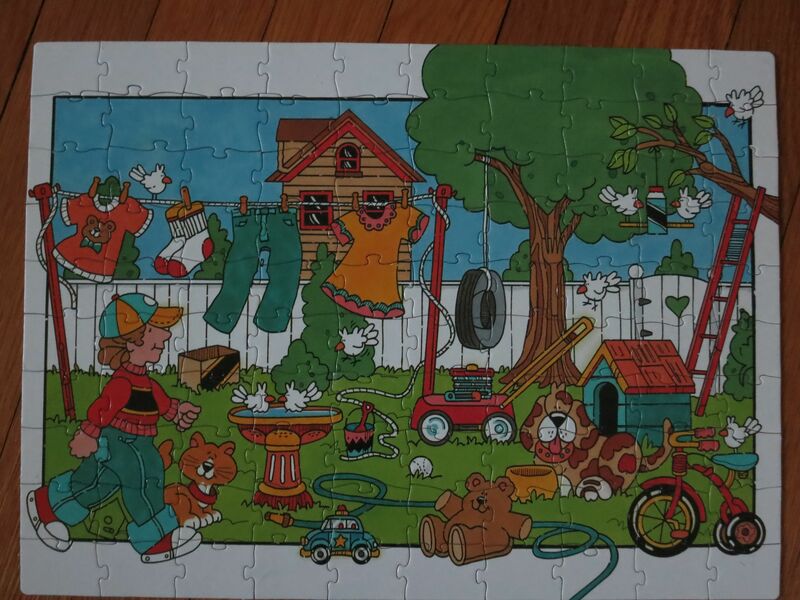 When we do puzzles from Goodwill, we know they won’t be perfect. We pat ourselves and the previous owner on the back for every piece we do have. So imagine my surprise when last week’s puzzle worked out like this. I am working on looking at my life this way too — additive, giving myself kudos for everything I do do, anything I do get right, instead of mentally docking myself for every little thing that subtracts from the perfection I irrationally think I should achieve. The lost puzzle pieces, library books, time, tempers, opportunities. It’s not easy. My old nickname, “High Standards Hilary,” still sometimes applies. But I also keep making choices to put more — and more contradictory — things in my life, whether it’s trying both to work and have lots of time with my kids, or to keep seeking out new and challenging experiences both at home and abroad. I am choosing to make the pieces fall apart and just hoping it all still looks interesting. Taking two young kids, a great husband, and a whole lot of questions to Jerusalem for a year's sabbatical.